As a private, First Nations-controlled and operated school, PFFNHS offers unique and culturally relevant educational services to students from 24 First Nation communities within the Northern Nishnawbe Education Council and the Nishnawbe Aski Nation. PFFNHS boasts a vibrant and active school community offering activities for every student’s interests, from sports like hockey, volleyball, and wrestling to leadership classes, a youth forum, annual powwow, winter carnival, career fair and school trips. The modern, traditional-style architecture houses a modern computer lab and library that are available to students and staff, as well as a science laboratory and a shop where native crafts are taught. There are nursing services and dental services on site. At PFFNHS you can also learn traditional skills like dogsledding, net-setting, trapping, snowshoeing, quinzee building, and survival skills. We also offer traditional technologies, such as birchbark basket and snowshoe building, paddle making, and tikinagan construction. 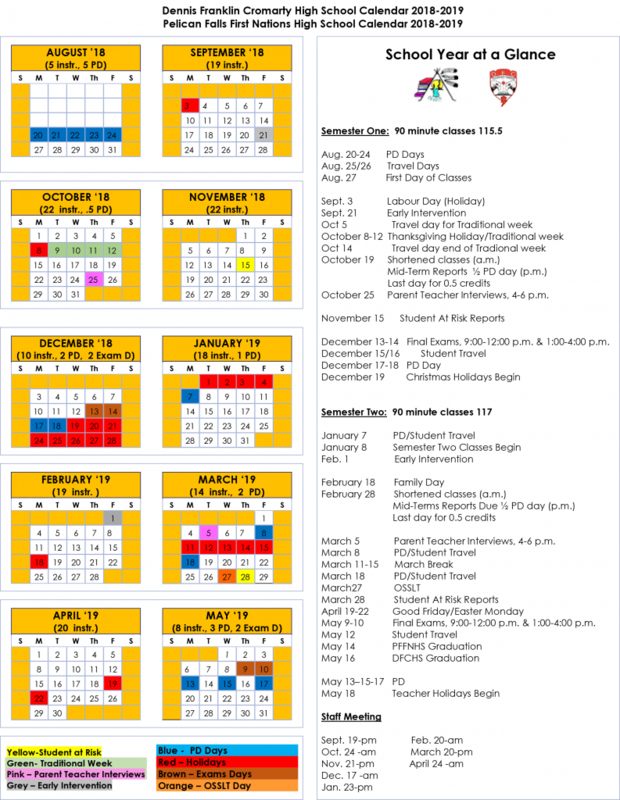 Download the 2018-2019 Course Calendar here!